Surely Nexus One owners will be glad to hear that Nexus One can expect to get Gingerbread update over the air in the next upcoming weeks. Isn’t that a perfect Christmas gift for a geek! A tweet from Google today morning confirmed this report that Nexus One will infact get Gingerbread update which is said to speed up the phone and also improve user experience. It is only a matter of time now before the update hits. 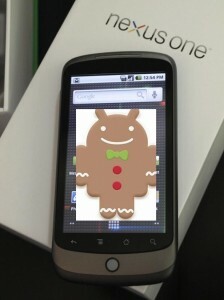 It was also reported that the new Gingerbread Android 2.3 is undergoing testing with customer user interfaces. Once the testing is done, its up to the carriers to push the update. With Gingerbread Android 2.3, users can expect a cleaner UI which is refined. Gingerbread also comes with a new and improved keyboard with easier OS navigation. Gingerbread also supports large screens or tablets. I’m looking forward to this on my Nexus One!